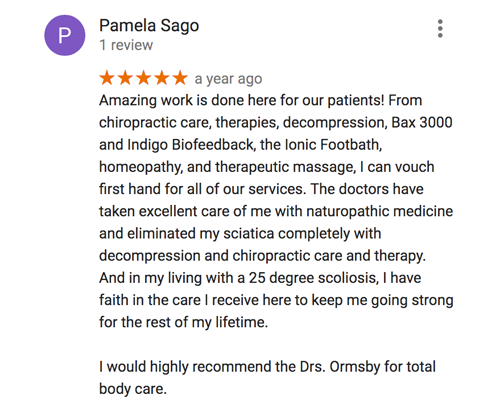 What others say about chiropractic care can help you make the right health care choice. Review a selection of our patient testimonials below and please contact the office if you have any questions. Great work by Synergy team. On the way to on the mend! Thank you for your help and patience with me. I appreciate everything and look forward to coming back. Good job, and I know you can fix my knee up so I can go back to my riding and keeping up with my home. Everyone at SYNERGY was very kind and helpful. Dr. Ormsby is fantastic. With an uncanny ability to know exactly what adjustments and therapy is needed, for each visit. I know Dr. Ormsby has taken his profession to a higher level rarely seen. 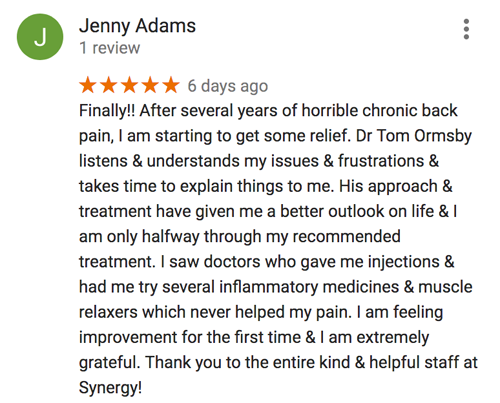 I have had plenty of experience with the Chiropractic profession and without exception SYNERGY CHIROPRACTIC is a trustworthy place to get the help and understanding you need. THE VERY BEST PEOPLE AND SERVICES! You are fabulous! Thank you for getting me in for a same day appointment as a new client. Everyone is so very nice, and I am happy to refer you to anyone needs your services. Choosing your practice, out of the numerous ones in Brunswick, was one of the best decisions I have made for myself. My pain is already decreasing and I am hopeful I will be 100% in no time at all. I also love the holistic approach to health that you offer.